This year’s Munich High End show was a hot one in every sense of the word (more so than ever given the unseasonably warm temps in Bavaria and the heat generated in demo rooms full of powered-up gear!). From a debuts standpoint, it's superseded CES as the place to introduce the most important new products. Widely considered the world’s biggest and best high-end audio event, Munich High End was also a hot show in popularity—not only because there’s reportedly an exhibitor waiting list extending to 60-odd names but also because of the number and diversity of attendees—both from the industry and from the music-loving populace all over the world—filling the halls, demo rooms, and even the cafés inside the MOC venue. In addition it’s the audio show where the most women turn up (and not under partner duress). The Mint magazine cover above is a good sign—the translation of its headline is "Women and Vinyl." In addition to the continued—and thrilling—resurgence of vinyl, tape, and all things analog, new integrated amplifiers were introduced in abundance. My assigned bailiwick at this show was electronics—this time across all price-points. Covering this huge category was made even more challenging due to stricter word count limits, so I was unable to include every last debut I came across. As usual, apologies in advance for any errors, oversights, or omissions. Let’s get to those hot electronics! Cyril Hammer and his Soulution team in Switzerland have done it again—only this time they’ve managed to make their magic at a more approachable price. They’ve created a new series of truly top-notch solid-state electronics that aims to deliver a large measure of the bloom, dimensionality, musicality, and effortless speed and grip for which Soulution electronics are renowned, while reducing the complexity of circuits and parts. 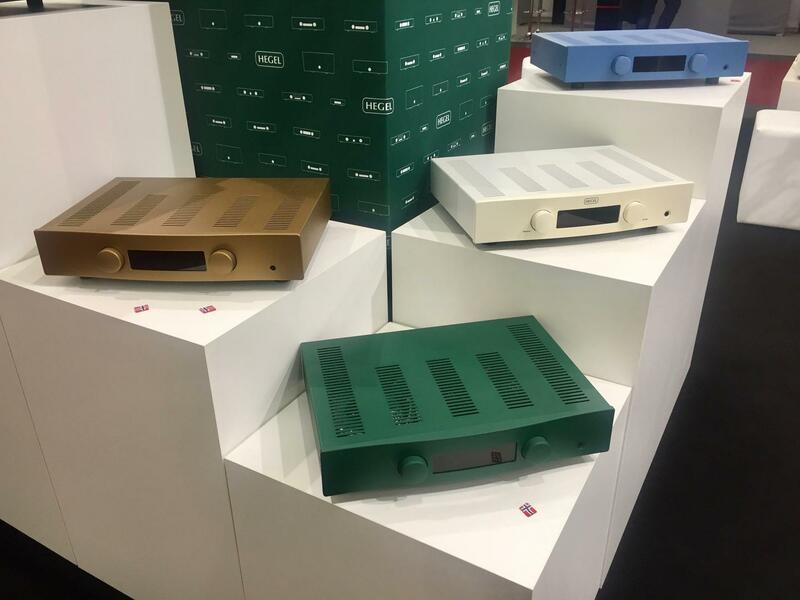 The entire series—which includes the 330 integrated amplifier, 325 preamplifier, and the 311 stereo amp with switch-mode power supply—debuted at the show on static display (although if you visited the room at the right time you may have heard the 330 integrated amp playing in the system). In addition to uniting preamp and amp in a single chassis, the 100Wpc 330 offers extra flexibility via an optional DAC and phonostage. The 325 and 311 also offer many of the same features as their Series 5 and 7 brethren. If you were fortunate enough to have visited this room, you heard one of the best-sounding demos at the show, full of incredible presence and coherence, combined with high-resolution realism. 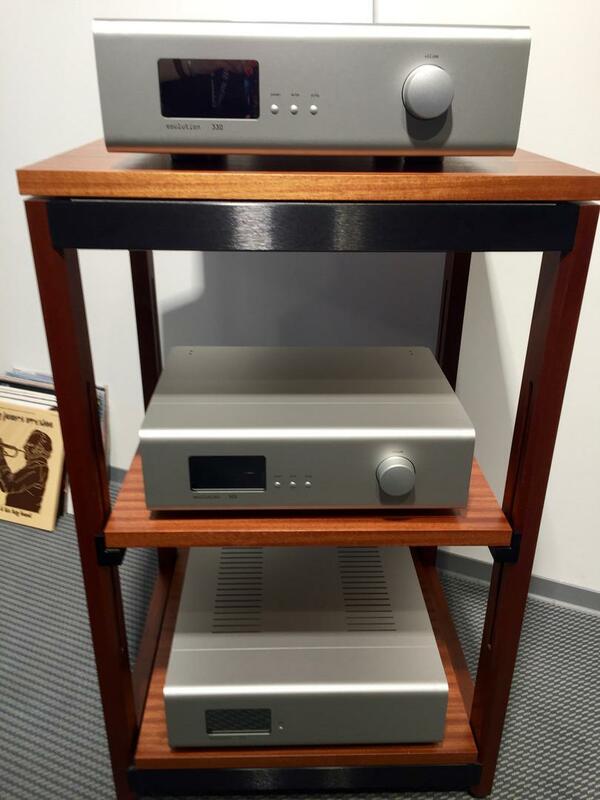 The core setup included a pair of Soulution 511 stereo amps (used as monoblocks), a 550 phonostage, a 725 linestage preamplifier, and a 760 DAC and DeBaer turntable in front of Rockport Cygnus loudspeakers ($60k). All gear was seated on Critical Mass Systems’ brand-new, top-line Olympus equipment racks and connected with Vovox cabling. The 300 Series electronics will begin production in October and prices are TBD. 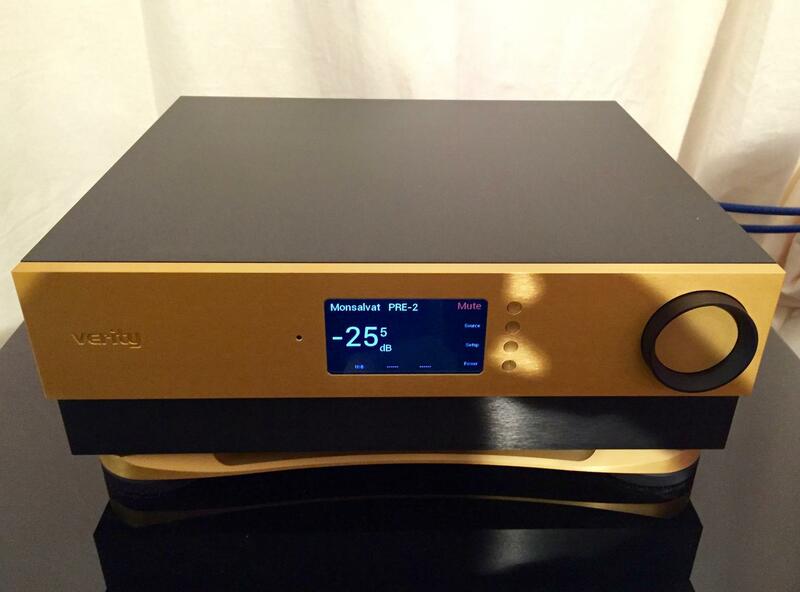 In keeping with the Hegel ethos of striving to keep prices low while adding more features and functions (in addition to maintaining great sound, of course), the Norwegian company introduced the H90 integrated amplifier—a replacement for its entry-level H80 model. Unbelievably, it did so at the exact same price-point as the H80. Rated at 60Wpc into 8 ohms, the new H90 contains a DAC, preamp, and power amp, featuring an upgraded Class AB output section. The H90 also features a semi-proprietary version of Apple Airplay (which uses Apple chips but purportedly has far better sound quality thanks to the Hegel engineers’ expert tinkering), accepts basic streaming, and has a headphone output. For added flexibility, input settings are configurable for volume settings and functionality with all devices. The H90 was on static display and is expected in market by late August. Another Hegel debut: In a surprising and stylish twist, the top-of-line Röst integrated, currently only available in white or black chassis, will be offered in three new color options (at a slight cost increase): green, sky blue, and a bronze brown. AVM, which hand-builds its products in Germany, announced a batch of new components—digital sources and electronics—in its flagship Ovation 8.2 series, all of which share the AVM 803 tube line stage (based on the company’s own AVM 803T double triode), and AC-independent high-voltage power generation. 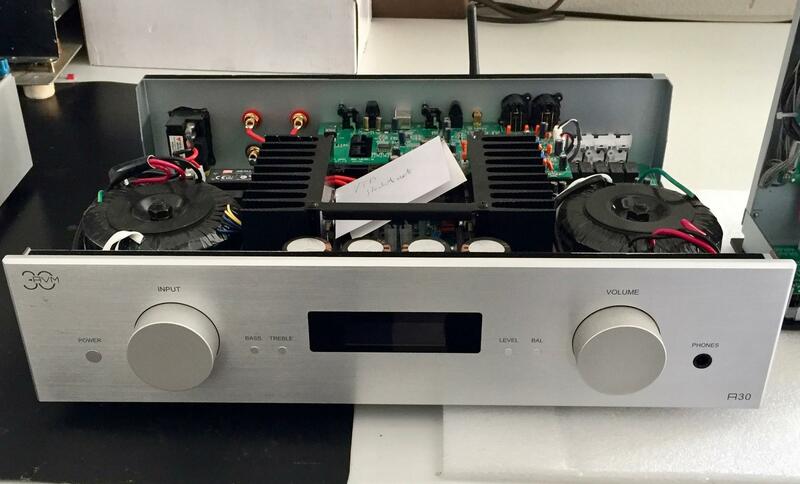 Within my bailiwick were the fully modular top-tier PA 8.2 preamplifier (just under $10k for the basic unit)—which is configurable; the customer can choose the plug-in modules, and the unit will detect them and automatically rearrange setup menus and so on—and the SA 8.2 preamp with hi-fi streaming and DAC (384kHz/32-bit and DSD128). If you have a PA 8, you’ll be glad to learn that the new modules are backwards-compatible and will automatically install firmware updates on prior models. Another AVM debut: the entry-level AVM30 series, named for the company’s 30-year anniversary, including the 220W Class A/AB M30 monoblock that reflects the company’s classic roots and features a trio of MOSFETs, a big transformer, and very short signal paths. 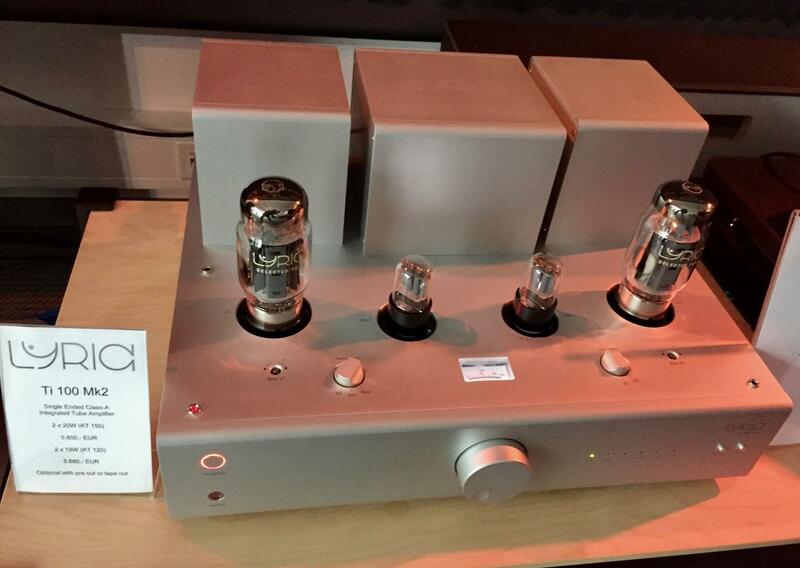 (The A30 amplifier is shown above.) The U.S. debut will follow at RMAF. 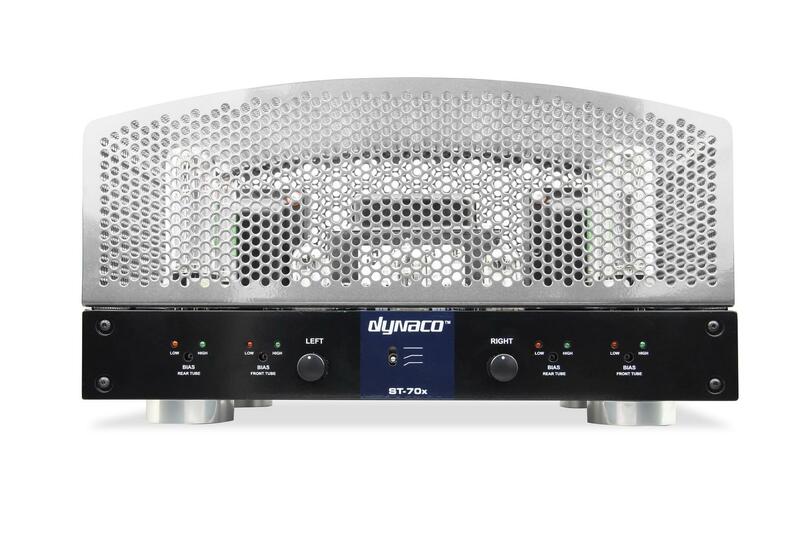 Well known as the best-selling tube amp of all time, the iconic Dynaco ST-70 amplifier has been revamped and redesigned in a Series 3 model in the relaunched Hafler-Dynaco line, now under the auspices of Radial Engineering Ltd. of Canada. Rated at 35Wpc, the new Series 3’s updates and upgrades include the use of more advanced engineering and higher-quality modern parts. In this Class A push-pull design, 12AU7 dual triode tubes are used in the front end instead of 7199 pentodes. The new power supply has a larger transformer with improved line regulation, increased filter capacitance, and a solid-state rectifier. Much attention was paid to overhauling the original output transformers to increase damping and low-frequency control. There’s also a three-position high-pass filter to enable low-end adjustments. Robert Harley had the chance to listen to the new ST-70 (alas, I did not) and reported that it was very dynamic, punchy in the bass (it didn’t sound at all like a tube amp in the bottom end), and played quite loudly. David Hafler would have been proud. Shipping begins in the summer. First off, there were a couple of noteworthy electronics introductions new to the European market but previously introduced at AXPONA Chicago: Aavik Acoustics presented its M-300 monoblocks ($48k each), which feature an efficient Class A output section with unique resonant power supply, and its C-300 preamplifier/control amplifier ($36k with one phonostage and PCM and DSD DAC), pictured above, driving the mighty Raidho D-5.1 floorstanders ($225k); the source was a Nagra CDT CD player used as a transport and wires were the new Ansuz DTC cables. Backgrounds were dark and resolution was high. Bass lines were well defined and easy to follow. A listen to an unreleased live version of Suzanne Vega’s “Luka” (recorded by Nagra at the Montreal Jazz Fest) revealed rich tone color and warm musicality. 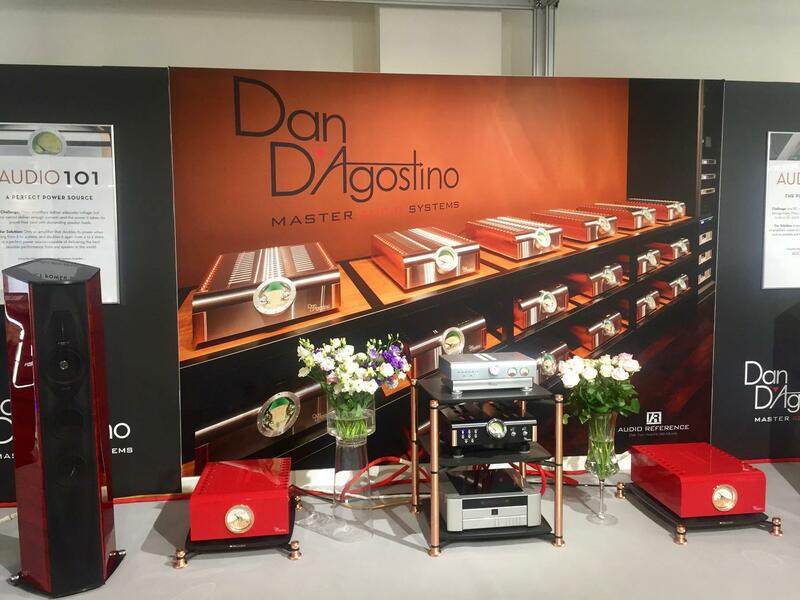 Dan D’Agostino Master Audio Systems Progression Stereo amplifier, also first seen at AXPONA, made its Euro debut on static display. Playing in an active demo were a pair of Progression Mono amps featuring D’Agostino’s proprietary Super Rail circuitry and conservatively rated at 300 watts into 8 ohms. D’Agostino products already stand out for their almost-Steampunk-like high style, but now the marque is upping the ante by offering custom finishes in most any automotive paint (or Pantone, RGB, or chips to match) for an extra $4k per chassis. The monoblocks in the system were a striking bright Porsche red (as seen above), the color also synonymous with the soles of Christian Louboutin shoes. 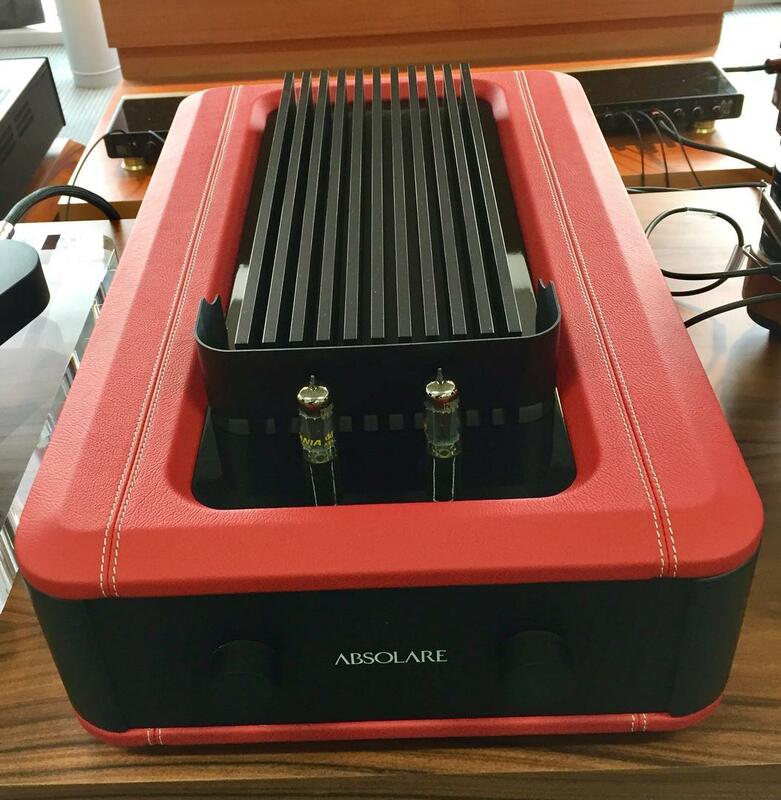 Speaking of red, the Absolare Signature integrated amplifier ($32.5k) clad in a finely crafted deep crimson leather made its world premiere in a rich-sounding system driving Rockport Lyra loudspeakers ($170k) with substantial heft and muscle. Featuring a hybrid architecture of pure SET preamplification and solid-state dual mono power amplification, the new Signature integrated delivers a minimum of 150Wpc into 8 ohms, offers several input options (either four RCA, four XLR, or two of each), and features a 48-step volume attenuator (remote controlled). 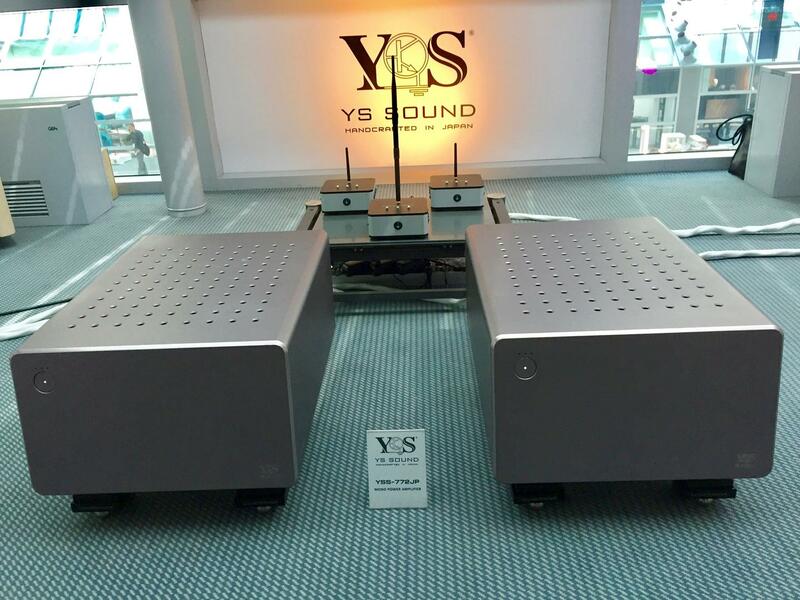 Another aesthetically and aurally pleasing setup was found in the Zellaton room, where handcrafted ultra-high-end Japanese electronics from YS Sound were introduced—the YSS-772JP mono power amplifiers (pictured), capable of delivering greater than 1500Wpc into 8 ohms, and the YSS-182JP preamplifier. The YS gear was driving the stunningly true-to-life-sounding Zellaton Stage loudspeakers (in a sleek white finish), with a state-of-the-art cabling from Schnerzinger. The Wilson Audio recording of Abel and Steinberg playing the Debussy violin sonata sounded more beautifully lifelike/natural here than almost anywhere else at the show. A Best of Show contender. 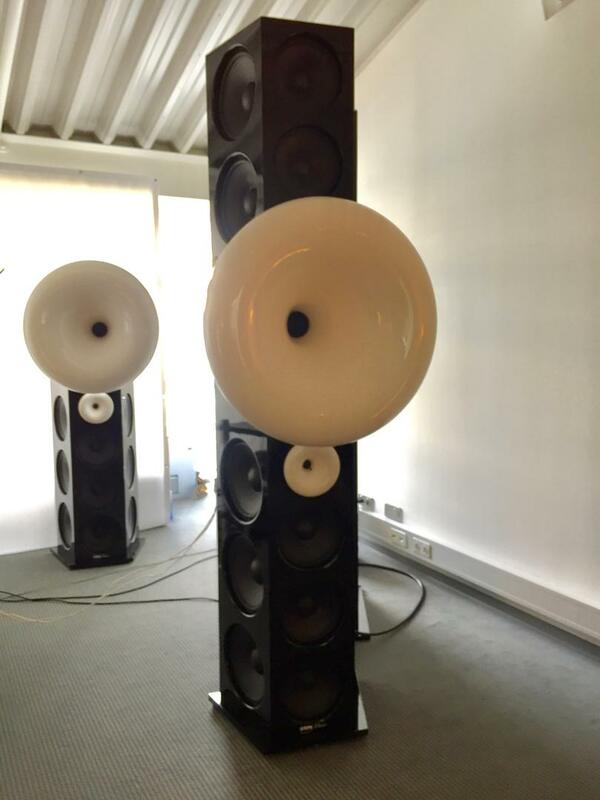 The multi-talented Holger Stein of Stein Music once again presented practically an entire system of his own creation from his Topline XL partially horn-loaded loudspeakers to electronics to cabling and Harmonizers and other exotic accessories that make quite a sonic difference. Stein introduced his new Signature phonostage with external power supply (€3k), linestage preamp, and a 350Wpc Class AB power stereo amplifier (€15k). U.S. prices and shipping dates are TBD. In the Stein room, the Abel and Steinberg piano and violin LP was presented with exciting dynamics, speed, and spaciousness galore, combined with easy naturalism. 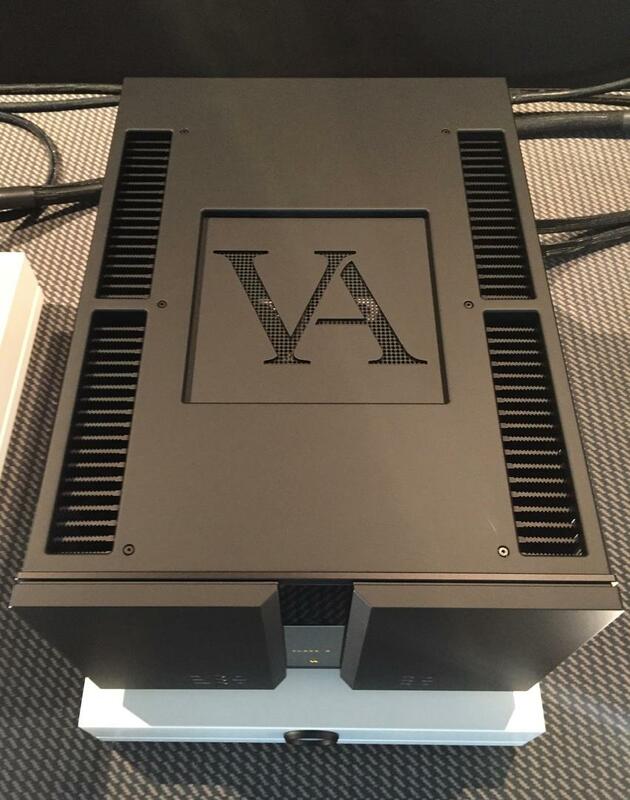 In another Holger’s room—Holger Adler of Voxativ—Voxativ sister company Lyric debuted its Ti 100 Mk2 integrated amp (€5800). A Class A design based around KT 150 tubes, the new 20Wpc Mk2 model features upgraded transformers and new capacitors and circuitry. U.S. pricing is expected within the next few months. 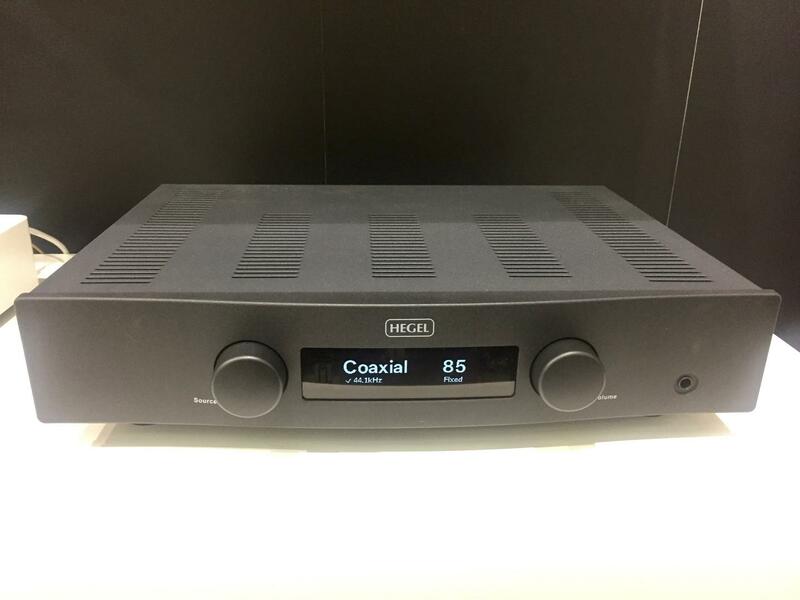 Axiss Europe presented a late-stage prototype of the Air Tight ATC-1X preamplifier that will replace its ATC-1 and also offer a phono section with two mm inputs. 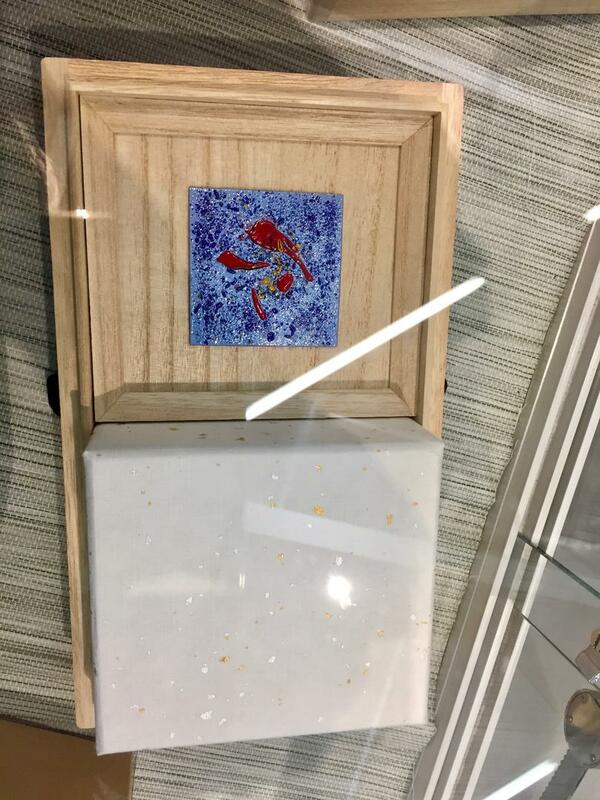 Also unveiled was a new, yet-to-be-named Air Tight cartridge that will come in a unique box with one-of-a-kind artist-made cloisonné. Vitus unveiled its close-to-production SM-103 Signature Series monoblock amplifiers (est. $60k/pr.). The next iteration of its SM-102 monoblocks (upgrades are available) offers improved regulators in the input stage to enhance resolution and soundstaging, and the addition of sound modes—such as Classic or Rock—to the output stage so listeners can tweak the presentation. Good news: I learned at the show that the Danish company is finalizing a contract with a U.S. distributor to be in this market later this year. 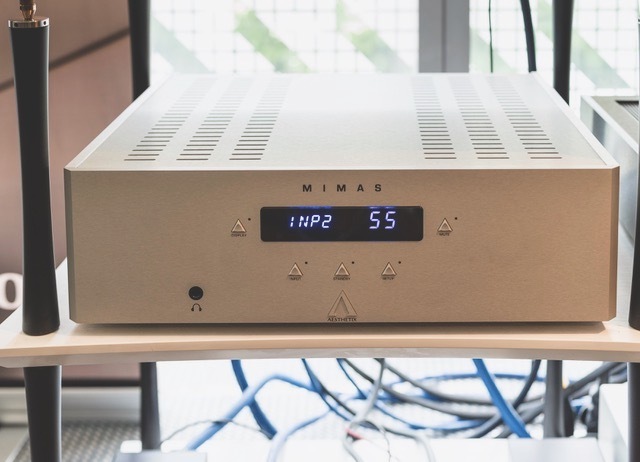 Aesthetix presented its new 150Wpc Mimas integrated amplifier, with a full-function remote control, five inputs (balanced and single-ended), a ¼" headphone out, and one 12AX7 tube per channel. Options include mm/mc phonostage with gain and loading adjustments via front panel or remote, and a DAC with RCA, TosLink, USB, 24-bit/352k, DSD and DSD2. The anticipated U.S. retail price is $7k with availability in September. 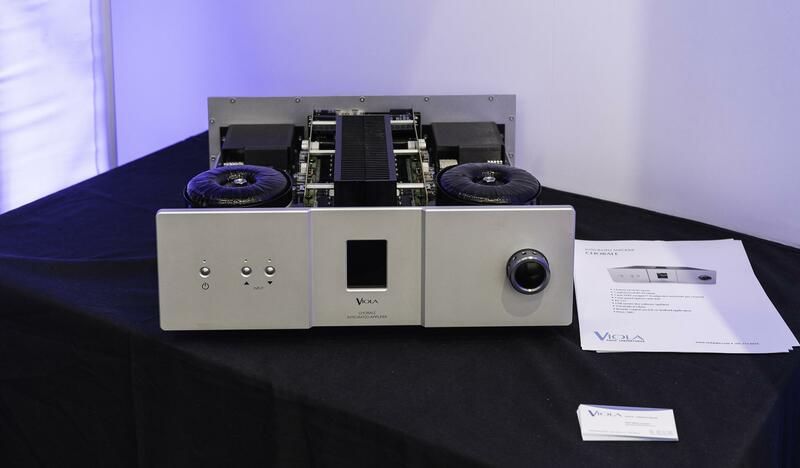 Canada’s Verity Audio, known for its loudspeakers, debuted its first-ever lineup of electronics at the show: the Monsalvat series including the Pre-2 ($35k) preamplifier/DAC with five digital inputs and two analog inputs (analog gets converted to digital at 32/384); the Pro-6 digital processor with preamp, DAC, and crossover and time-alignment functions plus external power supply; and the Amp-60 stereo power amplifier ($58k) with 60Wpc and high gain in Class AB topography. The origins of the Pro-6 (and Verity electronics) stem from the company’s development of a digital crossover for one of its larger speakers. The series is in market now. Viola Audio Laboratories introduced its Chorale integrated amplifier (pictured above) that delivers 150Wpc into 8 ohms and offers plenty of input options—three XLR and three RCA—plus two rear-panel card slots and a USB for software updates. Remote control is via iOS or Android app. The price and ship dates are TBD. Although Gabi and Edwin of Crystal Cable did not have a debut in my category, they did present an outstanding new wire offering: new Ultimate Dream cable. Sadly I only had the chance to listen very briefly but as always, the Diamond Edition Minissimo stand-mount/Subissimo sub combo (which I reviewed in Issue 273) driven by their Cube amp delivered the musical goods in lovely detail with a balance of structure, substance, and of course, inimitable style. 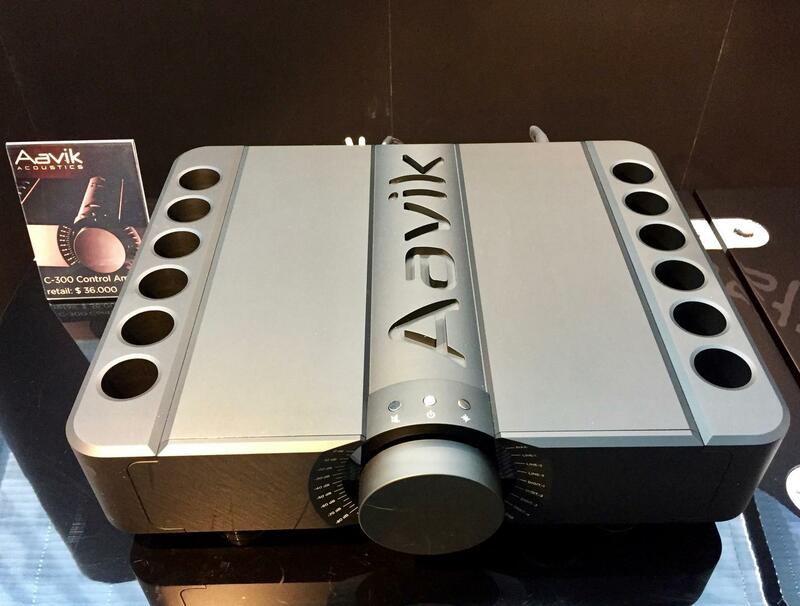 The new Mytek Brooklyn AMP amplifier was introduced as a counterpart to the hugely popular Mytek Brooklyn DAC in chassis styling and (nearly) in size; both are available in silver or black finishes. Not your old-school Class D amplifier, the Brooklyn AMP has Mytek claiming to have achieved a “triode Class A-sounding Class D” design that produces 2 x 300W into 8 ohms. With an expected retail price of $1995, no doubt this one will be a big seller—especially if the sound is as described. Delivery begins mid-summer. MBL X-treme Radialstrahler loudspeakers ($263k) driven by MBL Reference electronics (Reference 9011 monoblock amps, Reference 6010 D preamp) created a truly immersive sonic landscape. Rockport Cygnus loudspeakers ($60k) driven by Soulution electronics. Substance and dimensionality galore. Von Schweikert Audio Ultra 11 loudspeakers ($295k) driven by VAC Statement electronics (a system sounding even better than it did in Chicago in coherence, spaciousness, etc.!). Zellaton Stage loudspeakers driven by YS Sound electronics for captivating transparency and naturalness. Vandersteen Quattro CT loudspeakers ($19k) paired with Brinkmann electronics. Not inexpensive but full of impressive power, presence, and low-end solidity. Also in a brief demo, the Monitor Audio Silver 300 speakers ($3500/pr.) driven by Roksan electronics ($2k) displayed plenty of power-range presence and punchy energy. In an entirely surprising and out-of-the-blue move, the wildly designed and comprehensive Constellation Leo all-in-one system puts many a traditional sound bar to shame. And for the “cans” category, I must mention the new Audeze Sine DX planar-magnetic headphones ($599) and the LCD-i4 in-ear headphones ($2495). A plethora of new integrated amp introductions, plus open-reel tape decks galore once again! Too many to choose from, those MBL X-treme Radialstrahler loudspeakers! I’m also curious to check out the Constellation Leo more closely—and perhaps even audition it.